Last Wednesday, it dawned on me that it was exactly 2 years ago that I started this blog. I could hardly believe it! It feels like I've been doing this blogging thing for forever, but it turns out that it's only my second year of doing so. Huh. To be fair, when I created this blog back in 2011, I didn't exactly think that this whole blogging thing was going to pick up in the way that it did. And to think I started this blog for truly mundane reasons — that is, I was bored and frustrated with my job and life in Denver in general — and I needed an escape. Little did I know that the food blogging community would become one of my main support networks, one that would ultimately encourage me to find confidence in the kitchen, in photography, and in life as a whole. Thank you guys for reading this blog, and thank you for your support and kind words for the last two years. So, what were the highlights from my second year of of blogging? There was that time Saveur Magazine nominated yours truly as one of the Best Desserts & Baking blogs of 2013. Definitely THE highlight of the year. How I seriously upped my photo game and finally splurged on a fancy camera. My blog also underwent not one, but two logo redesigns. Perhaps one of the best things that's happened as this blog has grown over time is an increased access to food related events. 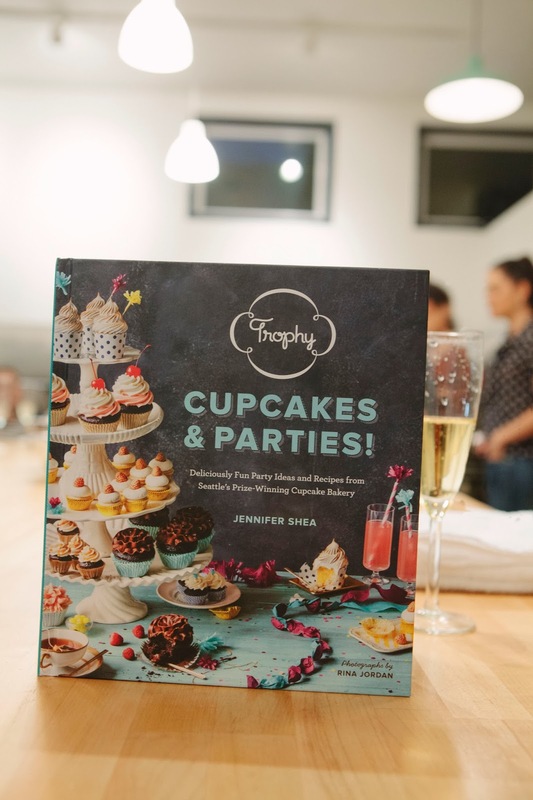 A few weeks ago, I was lucky enough to invited to a book party with Jennifer Shea, owner and founder of the famed Trophy Cupcakes bakery in Seattle, Washington. Trophy Cupcakes gained fame a few years ago when Martha Stewart herself declared Jennifer's cupcakes to be some of the best in the country, and invited her to her show to demonstrate how to make her famed Chocolate Graham Cupcakes. I actually remember inadvertently visiting Jennifer's first Trophy Cupcakes location in Seattle's Wallingford neighborhood back in 2008 (this might have been pre-Martha — there were no lines at the shop and only a handful of flavors available). I was blown away by their red velvet and lemon cupcakes. To this day, I can still remember how perfectly balanced – that is, tangy and sweet – their lemon buttercream frosting was (is)? 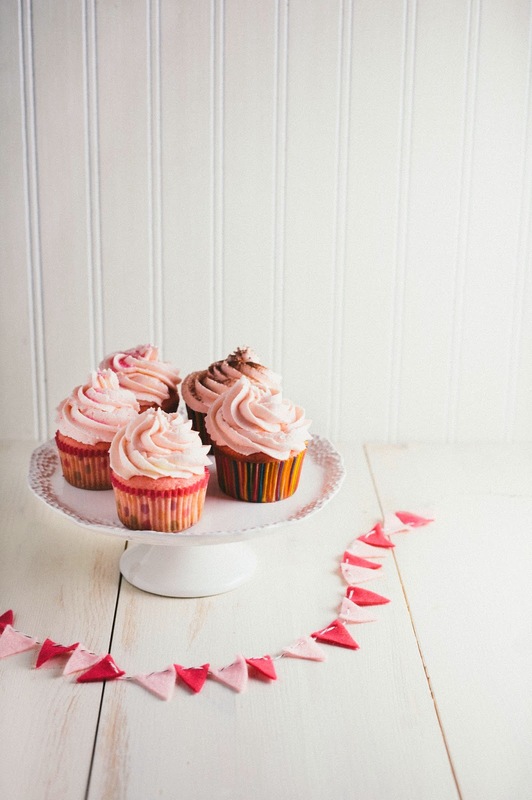 Is there anything more celebratory than a glass of champagne, and a cupcake topped with a swirl of pink frosting? I didn't think so. You can understand why I thought this was the perfect recipe to celebrate my blog's 2nd anniversary. Follow me (@hummingbirdhigh) on Twitter. Following me on Twitter gives you 20 entries in the raffle, increasing your chances of winning. Tweet about the giveaway. Tweeting about the giveaway gives you 5 entries in the raffle; just be sure to tweet at me (@hummingbirdhigh) using the giveaway widget so I know what's up. Leave a comment on this post. Explaining why you want to win Cupcakes and Parties would be pretty sweet, but really, congratulating me on my anniversary is more than enough. Leaving a comment gives you 1 entry in the raffle. The giveaway lasts for one week and ends next Sunday at 11/17/2013 12:00AM EST. Unfortunately, the giveaway is for US residents only. The giveaway is now closed; the winner has been contacted and will be posted shortly. CONGRATULATIONS TO ELISABETH G. FROM GEORGIA! And for those who came for the cupcake recipe, don't fret! I've got it for you below, along with my usual baker's notes. Enjoy! The book doesn't specify what kind of champagne to use. I went with a dry champagne, since I knew that it was going to be combined with a generous amount of sugar. The dry champagne worked wonderfully in the recipe, providing just a subtle tangy flavor. This is a fairly straightforward recipe, except for one step in the batter that requires you to mix a significant amount of champagne with a significant amount of half-and-half. Be sure to whisk the mixture immediately after combining the ingredients, or it will start to bubble and look kinda gross. Don't panic if that happens though — it's just what happens when alcohol and dairy are combined. To get my frosting swirls, I used a star tip from this large tube pastry tip set. The recipe makes a large amount of frosting (which, truthfully, I went though quite quickly on account of my generous swirls), so if you're not big on frosting you can cut the recipe in half and still have enough to frost each of the 24 cupcakes with a small amount of frosting. Preheat the oven to 350 (F). Line two 12-cup muffin pans with cupcake liners and set aside. In a large bowl, whisk together 2 cups cake flour, 1 1/2 cups all-purpose flour, 1 tablespoon plus 1/2 teaspoon baking powder and 1 teaspoon salt. Set aside. In the bowl of a freestanding electric mixer fitted with a paddle attachment, combine 1 1/2 cups (3 sticks) unsalted butter and 2 1/3 cups granulated sugar. Beat on low speed until the mixture is smooth and creamy, about 5 minutes. Add 3 eggs one at a time, mixing well and scraping the bowl after each addition, only adding the next egg once the previous one has been fully incorporated into the batter. In a liquid measuring bowl, combine 2/3 cup champagne, 2/3 cup half-and-half, and 1/4 teaspoon red food coloring. Whisk briskly for around 30 seconds. With your mixer on low speed, add the flour mixture (from the 2nd step) to the sugar and egg mixture (from the 3rd step) in 3 parts, alternating with the wet ingredients (from the 4th step) in 2 parts. 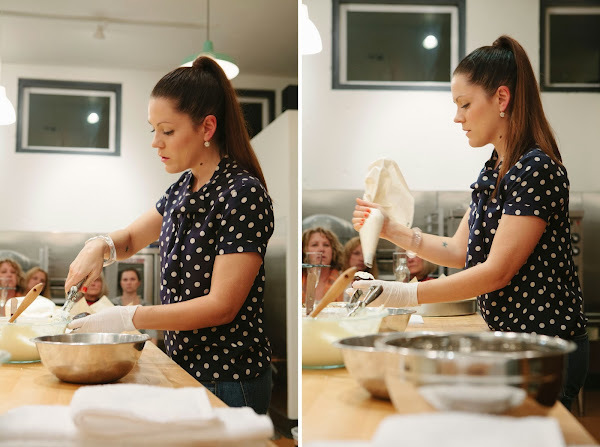 Mix each addition just until the ingredients are combined — do NOT overmix! Once everything has been added, use a rubber spatula to scrape down the sides of the bowl and the paddle, before paddling the mixture for an additional 30 seconds until just smooth. Let the batter rest for 15 minutes, before using a rubber spatula to stir gently before using. Use a cookie scoop to fill the cupcake liners three-quarters full and bake until the tops of the cupcakes are firm and a skewer inserted into the center of the cupcake comes out with just a few crumbs, about 20 minutes. Let the cupcakes cool for 5 minutes in the pans on a wire rack, before turning out to cool completely on the wire rack. In a freestanding electric mixer fitted with a paddle attachment, cream 3 cups (6 sticks) unsalted butter. Start with the mixer at its lowest speed, before gradually increasing the speed over time and using a rubber spatula to scrape the paddle and sides of the bowl as needed. The butter is done creaming when it is light in color, perfectly smooth, and makes a slapping sound as it hits the side of the bowl. 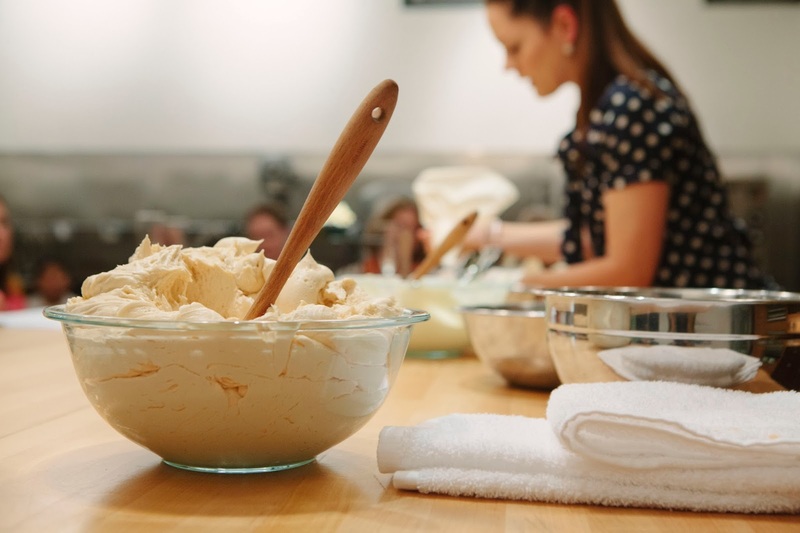 Once the butter has finished creaming, lower the mixer speed to its lowest setting and add 6 cups confectioner's sugar, one cup at a time, only adding the next cup when the cup before it has been fully incorporated into the mixture. When all the sugar has been added, scrape down the paddle and the sides of the bowl using a rubber spatula. Add 1/4 cup plus 1 tablespoon champagne, 2 teaspoons vanilla extract, 1/4 teaspoon salt and 3 drops red food coloring. Continue beating at a low speed for an additional 15 seconds, before increasing the speed as high as you can without making a mess. Continue beating until the mixture is perfectly smooth, creamy, and light, about 5 minutes. Use immediately. 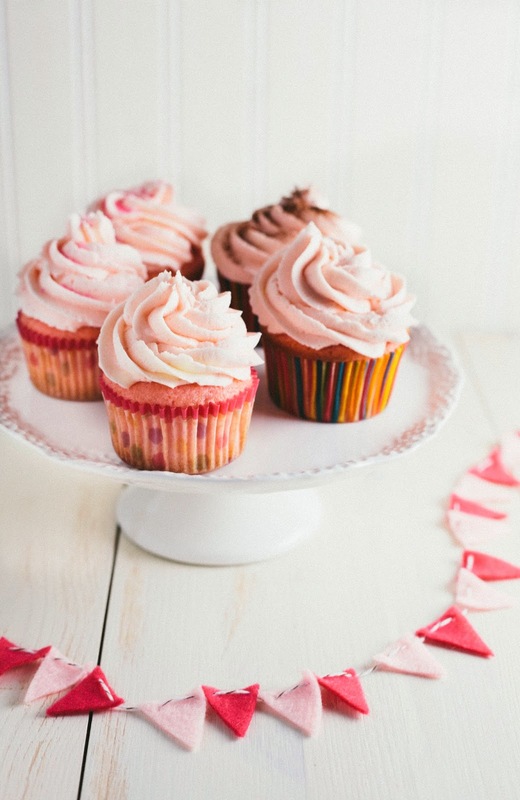 I love cupcakes and parties. I will make these cupcakes and also experiment by using my own home made Elderflower lemonade. Thanks Michelle, I am looking forward to making these! Congrats on your success! Wishing you many more years of bloggin' happiness. I will try this delicious recipe for my next work potuck...I am sure all the girlies and the guys will love them. Unfortunately, I could not enter your contest because i don't have a twitter account. (And I don't really want one.) Is there another way to enter, hopefully??? No worries! The third option for entry is leaving a comment on this blog, which you did — so don't fret! You've got an entry in the giveaway. Oh I so wanted to go to that event! 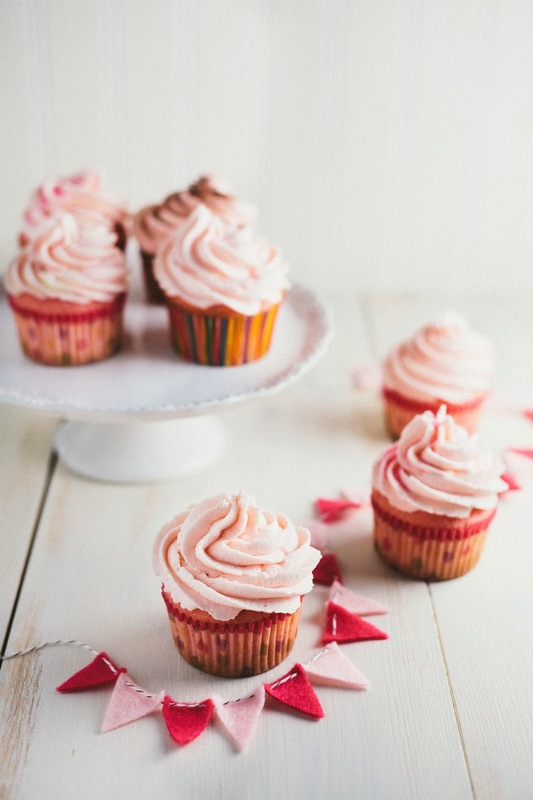 Your cupcakes look wonderful, that frosting, oh my! Congrats on 2 years. 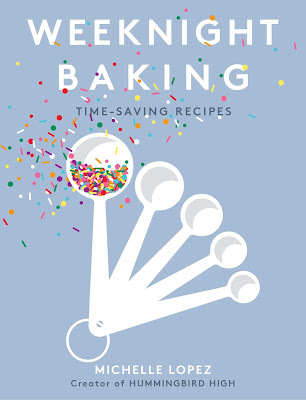 I love baking (and this book looks so cute!). Also, congrats on your blog Anniversary! Congratulations and happy blog anniversary! I've never been good at making cupcakes look pretty, maybe this book is what I need! 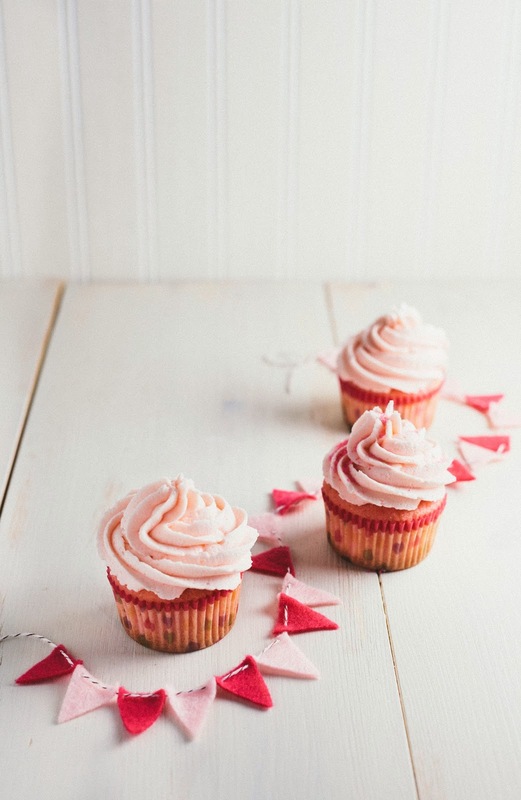 The pink champagne cupcakes look like they'd be perfect for me to make for my birthday coming up -- I wonder if they could easily be made gluten free? Happy 2nd!!! I've been searching for a champagne cupcake recipe since last year that isn't too complicated and would have great flavor. This looks like a winner! Congratulations...you are one of my favorite bloggers! Happy blog anniversary and congratulations on your success!! I would love to win Cupcakes & Parties because even though I really enjoy baking, I'm not so great at coordinating a theme to what I make or party planning in general. This book seems like it's filled with so many ideas and inspiration that I can't wait to read it. Hmm, I think I'll start with the pink champagne cupcakes! Congratulations on two years! Though I've only been following along for the past couple of months, I've enjoyed every post (and spent much time delving through the archives). Here's to the next two years! I want to win because Iove cupcakes! Happy blog anniversary and congratulations on your success!! I simply love your recipes, and try to rebake one of them almost every weekend! 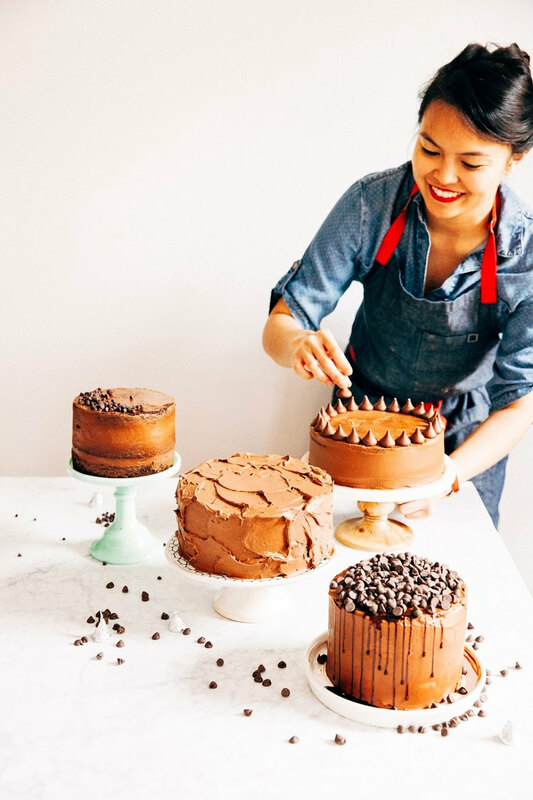 If you happen to read this, I don't own any dessert cookbooks because I rely so much on blogs. A physical book that I can spill milk and flour over would be such a nice addition to my kitchen. Thanks! Happy blog birthday! Can't believe it's been 2 years. Happy 2nd Blog Birthday! I just celebrated my first and can only hope to be as successful as you by my second. Keep up the fantastic work! Happy Anniversary! Would love to make more cupcakes for people in my life! 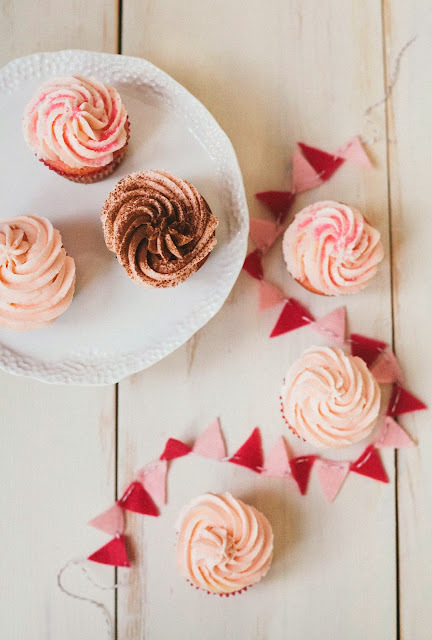 We are always having neighborhood gatherings and I would love to be able to wow them with my cupcake skills by bringing these adorable and tasty treats! I want to win because I'm going through a rough patch and a new cookbook would cheer me up. And congratulations on your anniversary! Congrats on turning 2! I'm always hosting events and baking so any inspiration is surely appreciated. I know it's plenty of it in that lovely book! My Mom bakes a lot and I would love to give this to her for Christmas! Congratulations on your anniversary! I just found you recently through your white maltsers cake on pinterest and I'm following you on twitter and pinterest and going to go look for the pumpkin rolls recipe I just saw a picture of :). I love to bake too! Congratulations! I'd love to win, because I love baking and the more ideas, the better.